The section of coast south of Yellow Banks is always mentally tough for me. Walking on endless loose, small boulders with very limited fresh water and no shade is tiring. This is where a hiker umbrella would come in handy for sun protection. 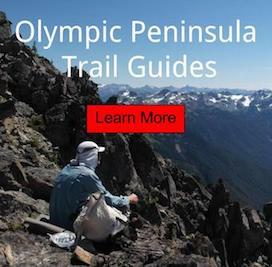 For those walking westbound/north on the Pacific Northwest Trail, this is the crux of the North Olympic Coast backpacking trip. I arrived at camp a few hours before sundown - not due to being tired but because I ran out of a hiking tide. You can only walk on the coast when tides are at certain height levels. Usually at points or headlands there is only a small strip of land between ocean and bluff. This makes these features of the landscape impassable - unless you can walk on water. I was antsy to get into the high country for mountain views, as the coast is where I make most of my winter backpacking trips. Generally, my time was spent sleeping or walking. I didn't really pause to fully enjoy the microenvironments. Preparing a hot meal after a long day of beach walking. Started my day one hour before sunrise to walk the max distance with the tides. Was ready to inhale some salt - after the sun cooked me by reflecting off the ocean. After dinner, I turned in early. Not wanting to miss the sunset, I set an alarm to wake me up. Once awake, I peeked out my shelter door and to my surprise - a wonderful treat. Up at first light to walk with the tides. Found a new favorite spot to find starfish. I had never been in this area at low tide prior to find the little guys hiding, pretty amazing. Today would be mentally tough because of light rain which made for slow going over very slippery coastal rock. Next stop, Rialto Beach. Looks like this starfish would give me real hiking competition this day. Happy to reach Hole in the Wall, a popular spot for tourists that walk in from the south. Planned on sleeping one more night in this area, until I saw how many campers were already here. Discouraged, I decided to push on to the next leg of my adventure. Looking south towards the world famous Rialto Beach. Waited in the rain for about an hour before catching a lift. Thank you very much to the folks who gave me a ride into town for food resupply.